The centennial celebration continues at Loyola University New Orleans this fall with the launch of a Presidential Centennial Guest Series. The Most Rev. Gregory Michael Aymond, Archbishop of New Orleans, will start the series off with his talk, “Catholic Education: Gifts and Challenges in 2012 and Beyond,” on Thursday, Sept. 20 at 7 p.m. in Louis J. Roussel Performance Hall, located in the Communications/Music Complex, on Loyola's main campus. For those unable to attend in person, the presentation will be made available via live streaming on Loyola’s website at http://www.loyno.edu/2012/catholic-education-gifts-and-challenges-2012-and-beyond. Archbishop Aymond will explore issues facing Catholic education today and invite response and commentary from an esteemed panel of Catholic higher education leaders, including Loyola University President Kevin Wm. Wildes, S.J., Ph.D., Xavier University of Louisiana President Norman Francis, J.D. '55, H '82, and Our Lady of Holy Cross College President Ronald Ambrosetti, Ph.D. The event is free and open to the public. Aymond, the 14th archbishop of New Orleans, holds the unique distinction of being the first New Orleans native to serve as archbishop of New Orleans in the 216-year history of the local church. He graduated from St. Joseph Seminary College in St. Benedict, La., earned a master's degree in divinity from Notre Dame Seminary in New Orleans, and was ordained as a priest of the New Orleans Archdiocese in 1975. From 1973-81, he was a professor, business administrator and then rector of St. John Vianney Preparatory Seminary in New Orleans. From 1981-86, he was professor of pastoral theology and homiletics and director of education at Notre Dame Seminary. Aymond served as president-rector of Notre Dame Seminary from 1986 until the end of the 1999-2000 academic year, longer than any rector in the seminary's history. 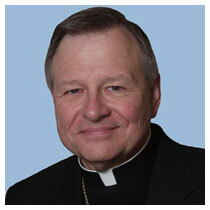 He was ordained as an auxiliary bishop of New Orleans in 1997 and became coadjutor bishop of Austin in 2000, succeeding to head the diocese until his appointment in New Orleans in 2009. Loyola is celebrating its centennial throughout the 2012-13 academic year with a host of centennial-based activities and special guest speakers. The Presidential Centennial Guest Series was developed by President Wildes and well-known political power couple and New Orleans residents, Mary Matalin and James Carville. The series will provide an array of cultural, artistic, Catholic and intellectual perspectives. Each will supplement Loyola’s mission of providing outstanding holistic Jesuit education and serving the New Orleans community.